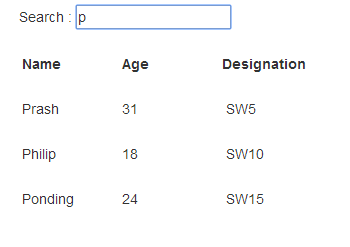 Angular js providing a very easy way to implement basic search and filter data using very less of code. Note : We are assigning ng-model = "searchquery" to the filter text box .This is the only thing we have to do for filtering the data. 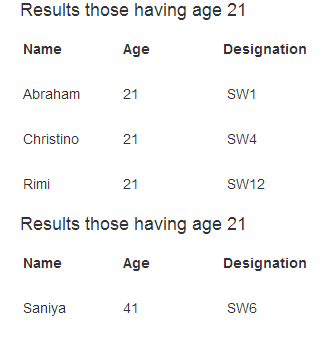 Let us take another example .By using the same concept we can filter the data very easily without doing any additional code .Suppose you want to show only the data of people having age 21 ,you can do that filter concept very easily in the view .